There is nothing new about jackets with leather sleeves—they were definitely around last year. But I missed out last time, and I'm definitely in the market for a new fall jacket, so to kick off this season's shopping guide, leather-sleeve jackets it is! And just in time, too—it may be balmy and muggy outside, but the temperature is going to drop this weekend, and then the real fall weather begins. I can't wait. 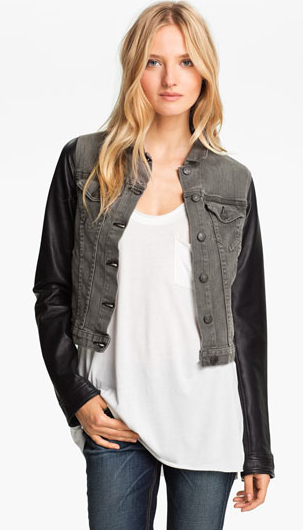 I'm not going to pretend this isn't a $2700 jean jacket, because it is. 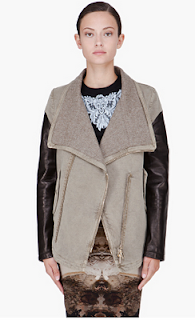 However, it's a $2700 Givenchy jean jacket with leather sleeves and an incredibly cool motorcycle-inspired cut. Also, it's lined, so it's probably a bit warmer than the average denim jacket. So it has that going for it. 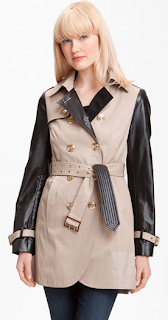 If you want to go a bit dressier and more tailored, a leather-sleeved trench coat is a great option, and even though this is from Burberry's secondary line, Brit, well, no one does a trench coat like Burberry. The fit and the details—leather piping, big buttons—both look impeccable. Probably my favorite coat in this post, this Mackage wool coat has an almost blanket-like look—it looks soft and snuggly and warm, and yet the leather sleeves keep it cool. Want. I'm not going to lie—I'm hopelessly devoted to Rag & Bone. I love pretty much everything they do, including this update of the classic jean jacket. Who knew leather sleeves would make such an impact? 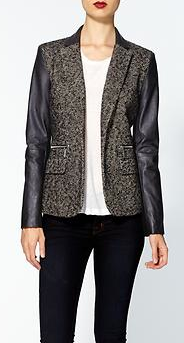 For the value-driven shoppers out there, this Sam Edelman convertible jacket can be worn with its leather sleeves, or without, as a vest. 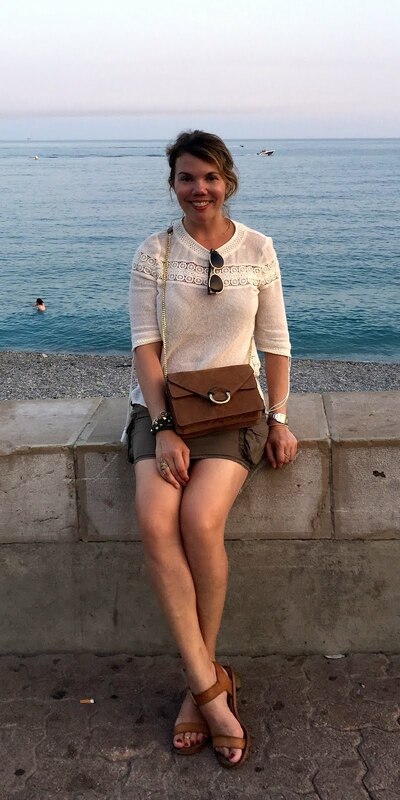 I often find two-in-one looks like this to be kind of clunky, but even zoomed in, I'm having a hard time even detecting where the sleeves detach. 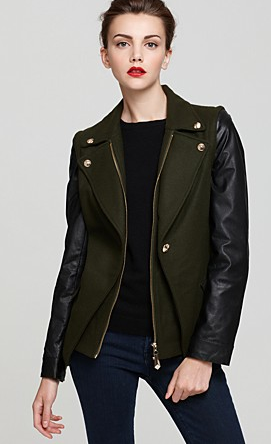 A warm welcome to the world of outerwear, Sam Edelman! Most of these jackets have been on the casual side, but this MICHAEL Michael Kors tweed jacket has a more tailored, work-friendly look. The sleeves are faux leather, but the look is very Kors-chic. 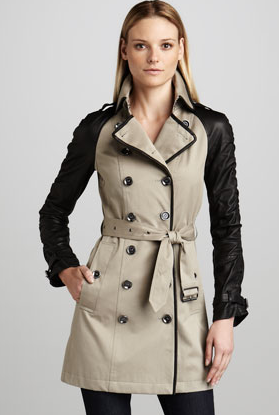 If you like the Burberry coat above, here's a Steve Madden trench for a fraction of the price. The sleeves are faux leather and the buttons are a bit over the top, but at $100, it's a much more budget-friendly option. 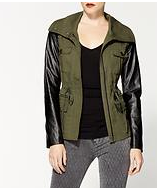 Chances are you've seen cool girls all over the city wearing something similar to Rhyme & Echo's Hannah jacket. And with good reason: It's an army jacket, only better. And this version is a very affordable $89. God knows, I don't need another black blazer. But with a snug double-knit body and faux leather sleeves, the Crosby Street blazer from New York & Company might just tempt me to get another one. It's sedate enough for work but cool enough to wear out at night too, and, at $100, a veritable bargain. Awesome collection of fall clothing. Thank you for sharing.